As far as an out-of-the-box, onto-the-stage solution, the M12 presents a very convincing argument. And that alone makes it worth investigation. Easy to use. Luxurious soft rubber pads. Very decent connectivity options. Lack of on-board sampling abilities. While full electronic drum kits have come on leaps and bounds in the last 10 years, they're still rather more than some drummers need. 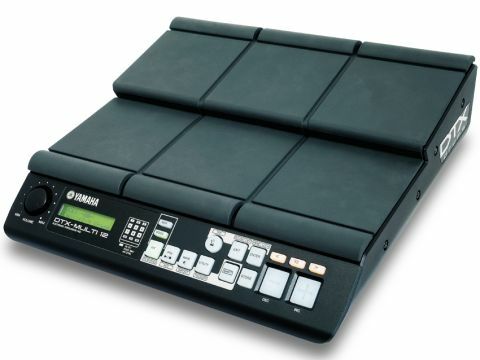 If your requirements are for a few electronic elements alongside an acoustic kit on stage then a 'multi-pad' like Yamaha's new DTX M12 will suit much better. "Even the control buttons are soft to the touch - interaction with the M12 is a pretty gratifying experience"
Yamaha's DTX line has always been well put together and the M12 maintains the standards set by the company's full kits. The bulk of the unit is of chunky, high-impact plastic - the type that typically shrugs off knocks - and its well-judged proportions mean it's easy enough to play while being easily positionable in a set-up. Hitting this 'sweet spot' in terms of dimensions isn't easy with an all-in-one module, but Yamaha have done well with the M12. Its six main pads have a playing area of roughly 100mm x 110mm, so provide a decent target area, while the six smaller pads (the rounded 'bars' at the top and bottom of the playing area) need a more carefully-aimed stick. The raised profile of these avoids too many misfires, though. The pads themselves are nicely tactile. A soft rubber surface yields for a nicely luxurious amount of 'give', making the M12 very forgiving on the wrists. And even the collection of control buttons are soft to the touch, both in terms of response and surface. All in all, interaction with the M12 is a pretty gratifying experience. Connectivity is another M12 strong point, with MIDI In/Out, 1/4" jack inputs to allow an additional five pads to be added, an Aux In socket, stereo and headphone outs and USB connections. It's a comprehensive array, one that places the M12 firmly at the centre of an extensive rig, controlling external sequencers or sound sources, should the need arise. Perhaps the biggest compromise necessitated by the M12's compact form comes in the shape of the two-line LCD display. In performance it's more than enough in terms of brightness and clarity, but its small size does mean more screen-scrolling and thus slower editing than would otherwise be the case. The title of this section could equally be 'Sticks On' or 'Fingers On', according to Yamaha. All three striking methods can be applied to the M12, depending on the instruments being played. Certain tabla sounds, for example, respond well to finger taps while congas are better played with a more forceful hand. And sticks are the obvious choice when using the unit in conjunction with a kit onstage. Contained within the M12 are close to 1300 preset sounds, culled from Yamaha's Motif synth engine or the DTXtreme III electro kit. And the vast majority are very good indeed. There's a good selection of percussion in evidence, a decent line in both electronic and acoustic kits and a noticeable dearth of useless novelty sounds or endless clanky variations of 'rock' kits. If you're looking for the odd sub-bass boom, shaker or tambo sounds to spice up your life, the M12 will have all you need straight from the box. If you want to really tap its potential, however, you can load up to 64MB of your own samples via USB. From here you can assign up to four sounds per pad, have them play all at once, or cycle through with progressive strikes. It's also simple to record your own patterns using the internal sounds and assign these to a pad; the pattern will then loop endlessly until the pad is struck again. The general playing response of the M12 is very decent, but unlike the super-organic Korg Wavedrum, its remit is not as simple as a perfect recreator of acoustic sound. Instead it serves to combine big, usable tones with the kind of 'control centre' vibe that makes for a flexible on-stage partner. And that it does very well.